2. Scribble pencil on the back of your printed letter. You only have to scribble on the parts where the letter and number are. Basically, it turns the print out into homemade carbon transfer paper. 3. Put your printed tile (right side up) on top of your wood square. 4. Carefully trace the edges of the Scrabble letter and number. Push hard and try not to go outside of the printed black part. You'll end up with a light grey tracing of the Scrabble letter. 6. Wait for the paint to dry, then flip the wood over. Measure the half way point near the top and make a mark with your pencil. 7. Hammer on your picture hanging hardware. (I got mine from Michael's.) Then you have one tile all done! Just keep going until you give up have as many as you want! i loved this since the first time i saw it, it's such a fun idea! This is a GREAT idea. I think it's amazing. You did a great job. Have you tried spelling words with your letters? 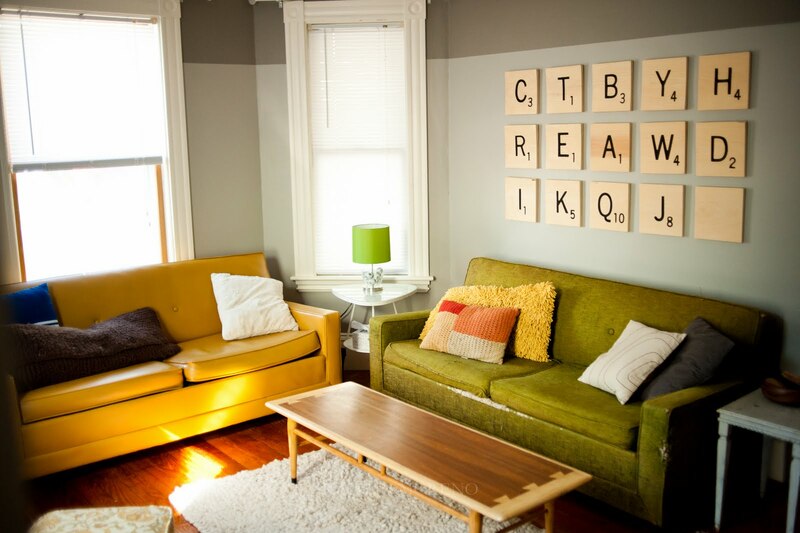 i love scrabble, and i love this decorating idea! great post! cant wait to try this , I Love Letters!!!!! Oookayyyy sooo I am in love with your project. I love how great it looks, I love how you did it and I am thrilled that you shared it over at my blog party! Thank you so much for linking up and for the inspiration! I can't wait to look around your place some more!!! This art is awesome! I've already pinned it!! ps I am featuring you tomorrow!!!! :o) thanks for linking up once again! OM Gosh! I LOVE these - so cute!!! Pinning! What an amazing hanging art. This is a very clever and fun idea plus they look so good on the wall. I think so... probably? Just make sure you put a lot of pencil on the back of the paper and press hard when you trace it. I would also suggest putting something hard behind the canvas if it's one of those framed ones where the canvas is stretched over wood - maybe a book? can you use mod podge to transfer to wood? But the thing is i dont know how, but i saw some similiar technicques they used a mod podge. Hi! Can anyone tell me how THICK the wood is and what type this is? I know it's 9 1/2 x 9 1/2 but I'm curious as to how thick I should get it or if anyone knows what kind of thickness is best for wall hanging? Hi there, to be honest I'm not 100% sure of the thickness we chose, but I'm almost sure it was between 1/2 and 3/4. Even if the wood I used was a little thicker, anywhere around 1/2 inch or 3/4 would be great for this project. Okay! Thank you! Do you remember what type of wood this is? I noticed that some of the wood available has more grain than some others and I love the texture of this wood! Okay great, thank you so much! And yes Ma'am! My best friends birthday party is tomorrow night and she LOVES scrabble related things so I want to make two tiles with her initials on them for her to hang in her home as an additional present. If I'm able to get a hold of the materials and make them I'll definitely send you pictures! Thanks again for all your help! What a cute gift!! Good luck and have fun! Here's a picture of the final pieces! Thanks again! OH MY GOSH!!! You must be the best friend ever - the tiles look great and I'm nuts for that cake! Beautiful!! How were you able to print the letters individually? I am doing something wrong. I want to surprise my husband with these. Hi Ksmommy! I used Microsoft Word to crop the image of all the scrabble tiles down to an individual tile then I stretched the individual tile image to the size I needed. You can use several different programs for cropping the individual letters - paint or photoshop would work too! When you stretch the individual letter it will look kind of blurry, but it should be clear enough to trace (steps 2-4). Let me know if you have any other questions! My guess is that the wood was 1"x10"x8' which means it's real dimensions were somewhere around 3/4"x9 1/4"x8'. If you open the image in Paint and crop each individual letter and print at that size these would be perfect for 1"x8" board size. I plan on doing this very soon in my apartment but I am going to use the newer Command strips to hang them to make the job even easier. Also, a good tip to hang these is to use 3" thick Painters tape to line them up and evenly space them out. Just a thought. :) Thanks for such a great idea! Do you know what the paint color on the wall is? Yep! On top is Elephant Skin and on bottom is Ashes, both by Behr. They're great colors that do really well in all kinds of light. I highly recommend them!